It was 10 a.m., chilly and rain was sprinkling down as Jasmine Holliman and other students hustled from the Cold Spring Lane Light Rail stop to the Polytechnic Institute, a little later than they’d like. 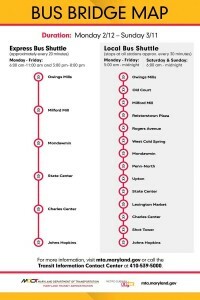 Today was the first day that the Metro Subway Link, which the students usually ride to connect to the Light Rail, will be shut down for month-long emergency repairs – an abrupt and stunning move announced by the Maryland Transit Administration (MTA) over the weekend. “I live over by Johns Hopkins [Hospital] and I take the Metro. That’s more dependable than the buses. You have no no idea when the bus is going to come,” said Holliman, a 10th grader who said she made a point of getting up early today and still wound up late. “I guess I’m going to have to get used to this,” Holliman said. Others not so resigned said the shutdown of a system used by 40,000 weekday riders reflected displaced priorities as well as abysmal management. “@LarryHogan your utter lack of concern for Baltimore is showing again. We deserve and demand more from you and your administration,” said one of many commenters blaming Maryland’s governor for the move. “1. Routine maintenance of transit infrastructure is crucial. 2. An entire subway system out of commission in a major city is just beyond. 3. Such a limited subway system is unacceptable in a region of this size. 4. Hard to be a reliable worker with unreliable transit.,” tweeted Stephanie Smith, an attorney running the House of Delegates in the 45th District. “Alternate theory: this is structural racism & classism, not anti-#Baltimore bias,” observed Barbara Samuels, a lawyer at the American Civil Liberties Union of Maryland. “In DC region, whites & mid-class use transit. State & suburbs don’t invest in Balto region’s transit because it is viewed as social program used mostly by people who are poor & Black,” Samuels tweeted. 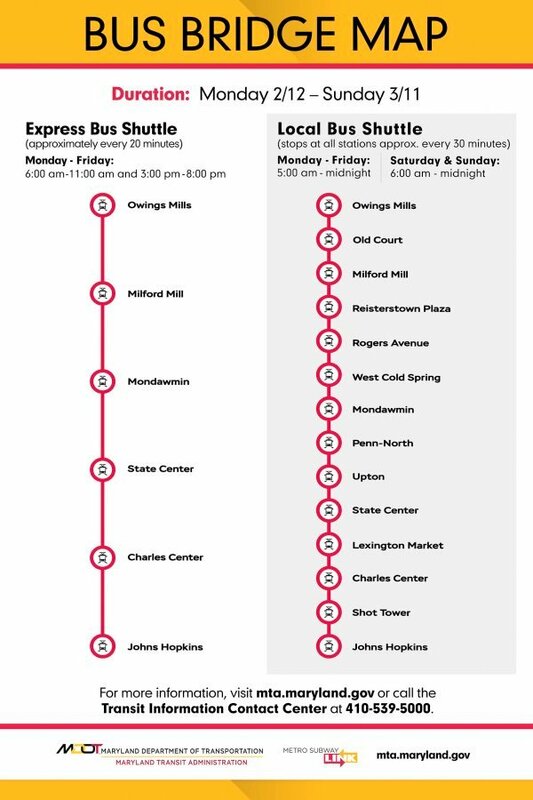 In the first announcement on Friday, MTA Director Kevin Quinn said the Metro would be closed over the weekend for emergency track repairs on the above-ground portion of the line that runs between the Owings Mills and West Cold Spring stations. Then on Sunday, the MTA said additional problems on the underground part of the line, running from Cold Spring through downtown to the Johns Hopkins Medical Center, required closure of the full 15.4-mile line. Out of “an abundance of caution,” Quinn said, he had decided to close down the system now rather than wait until summer, when scheduled maintenance work was to begin. He stressed that the Metro is 36-years-old, which actually makes the system much newer than the century-old subways operating in New York, Philadelphia, Boston and elsewhere. The agency announced that free express and local buses would be provided to transport people along the route. The Hogan administration announced that it was making $2.2 million to run the shuttle buses. “With bus bridges, we will be able to do the necessary rail repairs to reopen our system as quickly as possible while still providing our customers with critical access to work, school, medical facilities and leisure activities,” the MTA said in an official statement. Outside of Poly this morning, students like Holliman said they thought the bus bridges needed to be more dependable. 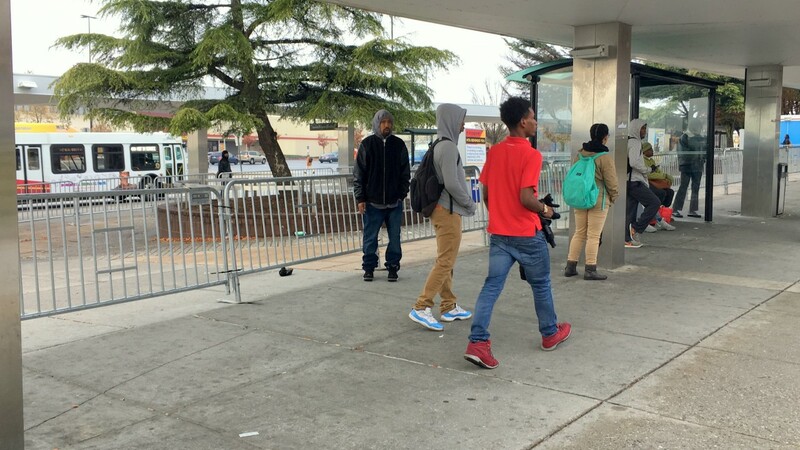 “It was very confusing for me this morning over there, and now I’m going to be late,” said an 11th grader who catches the Metro at the Mondawmin transit hub, which is used by about 7,000 students a day, according to Baltimore City Public Schools.